I want to reach out to the staff at LFR to say thank you! Our daughter, Ann Parker Meyers, returned home from camp yesterday. She has talked and talked about how much she loved camp since she has been home. Tonight I was reading some of the Bible to her and her younger brother when she asked me, "Mommy, have I ever been saved?" I said, well, you have never told me so, I don’t think you have. She said, “at camp Magic Scott talked about being saved and he told us what we needed to do to be saved and I said the prayer to myself but was too shy to tell anyone.” So tonight, I prayed with her to confirm it! I will forever be grateful for this camp and your staff that God used to speak to her heart!! Please extend my gratefulness to her tribe leader, counselor and especially "Magician Scott"!!! I would like to thank you for doing what you do, and doing it well. My child has attended student camp with Lemoyne Blvd. Baptist Church for 5 years. This year was her first visit for Camp Macon. I had the pleasure to drive up Saturday to attend Family night in Noxubee Co and then stay at LFR for the night to bring the kids home. What you do at Camp Macon is amazing. The community turnout and participation of the kids can only be a GOD thing. Our home church is First Baptist Church-Biloxi which I have attended since birth has a very sizable congregation and I have been a part of many community events. I have never witnessed a turnout like the one I witnessed Saturday night. It is something I hope to get to participate in the future. I then got to see what Maddie has been talking about for 5 years. From the first year she attended she came home and asked me to buy a calendar to mark off the days until she could return to LFR. She has done that every year since. Maddie has always attended church and Sunday School, VBS, and other camps, and none have had the impact that LFR has had on her. She comes home every year closer in her walk with Jesus. Maddie is super active in school, plays golf, basketball, and volleyball, makes all A’s, in Beta Club, FCA, Jr. Civitan. I see the difference that LFR has had in her life as she is confident of her Christianity, and her discipleship to bring others closer to Christ has grown every year. Every summer she turns down invitations to Disneyworld, cruises with friends, sports camps to come back to LFR. She has made close friendships with staff that I’m sure with be life long, as well as with other campers. Growing up in a Christian home and being saved at a young age, church wasn’t an option, it was a privilege. My father is a Music Minister and my mother a Sunday School teacher. We served at a small church that did not have many opportunities to attend youth camp. I attended one camp in my 8 years of youth. Six months ago when my husband was called into student ministry at Trinity in Marianna, we began to hear many of the wonderful LFR stories. Little did we know we would soon be planning to attend. We came hoping to grow our students in their faith but left growing in our faith as well. I have never seen a group of people who love the Lord and are TRUE servants of Christ as I have seen in your staff this week. The fact that each counselor took time to speak to us about our students, took time daily to pray for and love on our kiddos and to literally pour their heart and soul into this ministry meant the world to me. As I sit here watching counselors wash their students’ feet, I am truly seeing the goodness of Jesus! Thank you for all you do to keep this wonderful summer camp as Christ filled and full of love that it can be! LFR is amazing and so is the wonderful family you have built here. We are having our first baby in February of next year and cannot wait for him/her to experience God’s love in this place in the many years to come-even at 4 months old next summer. Keep up the outstanding work! Love God. Love people. LFR After Dark was a very moving experience. The group I was with was so moved and I was so humbled and blessed to see God speaking to them and touching their hearts. I am always impressed by the passion each staff member has for the campers and the Gospel. This is why I always bring my kids and students here. This was the first year for my children to attend (ages 9&10). My son has High Functioning Autism and sensory issues so I was concerned on how he would do. His counselor listened to my concerns and tried to understand how to watch for possible issues. We are now on day four and my son has had no problems. Even though Blake was sick, his replacement was able to watch over the boys seamlessly. My children have no desire to see me or talk to me which means they do not need me. They feel safe and secure which is what I wanted for them. One of our campers started crying while their counselor was praying for them because they have never had someone pray for them in that way. It was moving to her and had an impact on her. I am so thankful that the staff was willing to be flexible and adjust the schedule for Mini Camp C to include LFR After Dark. What an incredible experience…not only for the kids, but also for the adult leaders. Thank you for pouring into our children and us! Love it here at LFR. Lake Forest Ranch is my happy place – excellence in everything and commitment to adult leaders and kids. It is a blessing to have the staff pour into our kids. This is a GREAT aspect of LFR. I was blessed by God working through Tina and other church adults to calm and focus a work/home decision my husband and I are making. The camp atmosphere helped me to stop and listen to what God had to say without the world getting in the way! Just knowing that the kids are wild and the counselors maintain them for a long weekend; the counselors getting on their knees and washing their feet was powerful not just for me but especially for the kids. I can’t tell you how thankful I am for your staff of counselors and work staff. All of our children have been impacted by their love this week. It is evident that time has been spent pouring God’s love into each of them because they all poured it back out so graciously into our campers. From the counselor who spent some tough days with the rambunctious boys to the one who played tooth fairy to a young camper convinced that it would happen at camp, they showed God’s love to these kids in too many ways to count. Thank you for following God in this way. The world is getting harder for our children and it is a tremendous blessing to be part of what God is doing at LFR. One of my campers that is in my Bible Buddies class back home got saved this week. Super excited for all the people God has used in her life! Two campers who had been inquiring about salvation over the past year made decisions to receive Christ. Camp this year was not just powerful for our kids but our adult leaders as well. One of my favorite times is the adult Bible Study. It is always so powerful but this year really meant a lot. I feel like God was able to answer prayers and speak to me clearly. Thank you for valuing, loving and serving us. Meg had some emotional girls in her cabin from our church that needed to know the Lord’s goodness to them as they were encouraged and made to feel safe and loved and comforted. It is clear that God was good to them this week to see the kindness and gentleness of a college student who, before this week, they had never met. I saw a lot of kids stepping out of their comfort zone this week. Before we got to camp we prayed for God’s will to be done, that my grandson would see Jesus here and that someone would be the example he needs to see. I did not realize as an adult leader that I would not be helping in the cabins as a leader. I was not happy. I was angry because I was not in the cabin with my grandson. I wanted to make sure he was safe and that no one would pick on him. The next morning when I was doing my quiet time, I prayed for my grandson to have someone to watch over him and it was like He said “I did, he has 3 counselors and a whole staff of people here.” Sometimes I feel as if I am the only one God can send but I should not have been surprised when God answered prayers. Sometimes I need to stop long enough to smell the roses and see what God has done for me. I have to learn that I don’t know it all like I thought I did. What a blessing the theme and how each of its elements were brought to life in each activity. I had a wonderful time in Adult Bible Study. It’s nice to come and be a part of something for myself as well. We had a great week spiritually! Several of our kids told us through the week how they felt a deeper calling into their walk with the Lord. We had one child accept Christ! We are thrilled! LFR After Dark was a great spiritual experience for me! (I.e. the nails, the singing, and the end ceremony). Two kids accepted Jesus and understood! I was reminded of how precious each kid is. I want to continue to see kids the way God does. This week was so refreshing and encouraging as a returning staff member to have the chance to see camp through the eyes of campers! The theme was such a sweet reminder that if we actively get quiet and still we can experience God in the simple and small ways like through the senses! Thank you so much for being a safe and encouraging source of growth! It was a blessing just being here. Taste and see that the Lord is good was a great theme. The studies and devotions sent a very strong message that the Lord is Great and Good and that all sins are forgiven and forgotten. It’s something to say and know but to really feel that unconditional love is special and it’s good to be reminded (no matter our age). I have really enjoyed the adult Bible Study time. I always seem to find myself distracted during Sunday School at my home church as we are very small and a few people wind up doing most of the work. I thought the “Taste and See” theme was very unique and well done. “LFR After Dark” was special. We brought a boy whose family has been struggling with depression. He has a younger brother who has been considering suicide at age 6. His mother has been praying for his salvation for years and he has been putting a wall up about it for a while. He was not originally attending camp, but the night before we left, another boy was unable to go all of a sudden. Meanwhile, the struggling family was at a peak hard time. It was showing in the parents, the boy and all three of his younger brothers. He had been completely against coming to camp but considering we had an opening and completely paid for spot, I figured it couldn’t hurt to ask him and his mom one last time for him to attend. I asked and they returned my call later that night around 11 pm saying he could go. 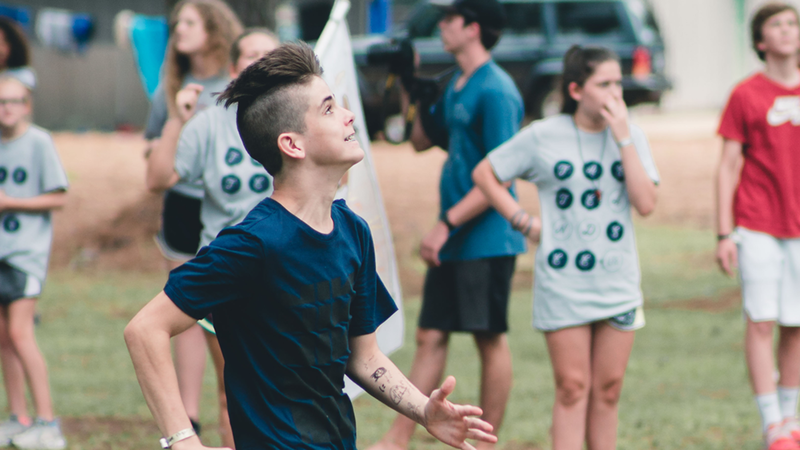 He accepted Jesus as his Savior at camp. We all can’t help but feel like this is a God-thing. We are so thankful for LFR and for pouring into this camper and all our children this week. I was hired officially to be the Children’s Minister at my church in February of this year and the first decision I made was to sign my kids up for LFR. This place has been so impactful in my life and I wanted to share that with others. My parents met here. I was a middle school and high school camper, a Sunshine Club leader for two years and after a little break, I got the pleasure of being a counselor. But this role, bringing kids to this place, this is my favorite and most important role. That seven hour drive was worth it and I hope I get to do it again, again, and again. My kids had a blast and I am so thankful that they got to “Taste and See” that the Lord is so good! Thank you LFR for being a positive and uplifting place that always encourages us to keep our eyes on Jesus. We love and appreciate LFR. We come back year after year because the Spirit of the Lord is here. The fantastic summer staff and the strong spiritual base in them is the main reason our kids love LFR. Our students are counting the days until they return. They have many friends that they keep up with all year-round from camp. We all feel God’s love in this place, we feel at home. As an adult, I love that there are no cell phones allowed. I also love that there is no cell service here. It is a place to be still. Camp was a great experience for my whole group. They all connected with their counselors and are going home with a desire to apply what they learned during camp to their lives. LFR After Dark was so well put together. All of the kids were profoundly impacted. It was huge. I love how well you take care of adult leaders. Thank you so much for a refreshing week! I really liked the foot washing during LFR After Dark . It really brought the servant heart out and to reality. It was amazing! I brought 2 girls this week, 10 and 13, who are not saved. They have been through so much at such an early age. They have heard of God and Jesus but do not really know much about Him. This week has been so amazing to see them have interest. They have begun to ask questions and I know the 10 year old felt something this week and came forward during invitation. This scared my 13 year old. She asked if her sister would love her if she was a Christian and she herself was not. We had a great talk together. She is not ready to trust Jesus yet but I am so thankful for LFR because I pray that this is the start of an amazing journey for her young life. As a mother of 2 teenage girls, this week has been amazing. My youngest daughter has grown so much and my heart is so full of joy after being here. LFR has been amazing! To see the counselors so in love with Christ that they willingly have loved on our children this week has been such a beautiful thing to watch. When we attended LFR After Dark, my heart nearly burst. I grew up in a church that did the “foot washing” and remember when one of my mentors washed my feet. It was such a special time and 15 years later I still feel the love and bond that we shared. So to see the counselors take those children and wash each child’s feet was one of the most beautiful pictures of Christ’s love. My daughter was able to participate and I pray she will always remember the moment where her counselor humbled herself to love on my child! LFR is a wonderful place that has loved us unconditionally this week and I will forever be grateful for all you did. As a mom of three (two preteen girls) I felt especially blessed by the truths presented in Pow Wow and adult leader’s Bible Study. I am so thankful that we encountered God here this particular week. It was definitely a divine appointment. Many, many spiritual blessings: our kids opened up, two accepted Christ and others growing deeper and developing the hunger needed to pursue God. Rest for myself, refreshment, reminders, able to get clarity and stop the busyness. Thankful, so thankful for a million things – big and little details. Our students really saw a need for God’s Word and how much he loves them. I was personally very ministered to and revived from this week. It felt like a personal retreat. I love how you guys love on the youth leaders and treat us like royalty. God spoke to me about trusting Him with the future, meaning I do not fear it, and to embrace the goodness of God and to really “taste and see.” There are many things I could say about this but I just appreciate the Spirit behind everything said and done-that the motive is to win people to Christ and to help them grow. So this last year was the hardest year in the ministry. With problems in the church and having so many youth that I could not minister to them all, it broke my heart to see many of my adult leaders who I trusted to minister get caught up in the drama. It made me sad that the students could not be discipled the way God was wanting. But this week has helped me remember that He is still good even in the difficult times. Looking back I can see how this has driven me to a much deeper walk with the Lord and a reliance on Him! Thanks you for such a great place to come and be renewed. I love LFR. We have a student who I have been praying for that comes from a single-mom home. He goes to a very big church in our area that does not have very solid teaching. Before camp (& listening to Jason Curry) he was not sure of his salvation. Now he is 100% sure and excited to go home and talk to his grandparents who are unsaved. Praise God! This camp in particular seemed to help a lot of our students come to a new clarity about salvation or their faith. We had a couple of conversions but almost as importantly, we had several who expressed that they got questions answered, doubts erased, or confusion cleared up. God helped me to recognize where I have fallen and where I need to go from here. I loved continuing to grow in my relationship with God through being stretched. This week, God taught me to be wholly dependent on Him through physical limitations. I also feel that He used me as an encourager to the students He allowed me to bring in my group this week. It was great seeing how our team of students was stretched and grew so much and to see our students truly do ministry and enjoy ministering to others. We had great team building opportunities for our group too! I was excited to see how God is expanding the ministry in Noxubee County and was challenged to better do ministry in our own community. Camp Macon revitalized my passion for students. I’ve been passionate about students but this week has pumped me up. I am ready to go home and pour heavily into my students there. I lead a group of Middle School boys and I want to put as much as I put into these students this week into my students back home. This week God changed my life. I loved being able to share the love of God with these kids. I feel as if I grew closer to the Lord and the students of Noxubee County. This week reminded me of how great of a calling we have to just love people. The relationships built this week are a genuine reflection of the love of Christ. I think of all the new relationships I have. God has helped me, along with all of my co-captains, to get out of my comfort zone. As a result of getting out of my comfort zone, I was able to witness to many kids. Camp Macon helped me with having boldness and confidence to lead studies and talk to both kids and fellow missionaries. I also got to see how Christ works when I saw a kid who has been on my team the past two years come to Christ after he has been one of my more difficult kids. God taught me a lot this week. I learned how to tell others about the Gospel of Jesus. I was also pushed to overcome my fear of being afraid of what people think about me. Instead of being hesitant of sharing the Gospel, I was pushed to just go for it. This has been one of the best weeks out of the whole year. Thank you. I felt He used me as a light for some of the kids at the Life Center. A few of them have difficult home lives so I believe God used me as an example and “light” for those kids. He also showed me the truth. I have lived in Macon my whole life and never really saw the part of town that the Life Center was in. It was truly eye opening to see that not everyone has what I have. I think of how wonderful it was to worship and feel God’s presence around me. I loved how we got excited and would cheer when someone was led to Christ. I loved the atmosphere of love for everyone. I loved the kids and working with them brings me back to when I was their age and how I wanted to be treated. I loved coming and love the work that’s being done here. Also while I was here so many miracles happened.